Fighting super villains isn't a job for everyone! It takes the wisdom of Athena, the strength of Zeus and the grace of Aphrodite. Of course, a few cool accessories made compliments of Hephaestus never hurts either! Normal girls probably can't just give the Greek pantheon of gods a call to bestow them with some powers and equipment, but that's why you have us. 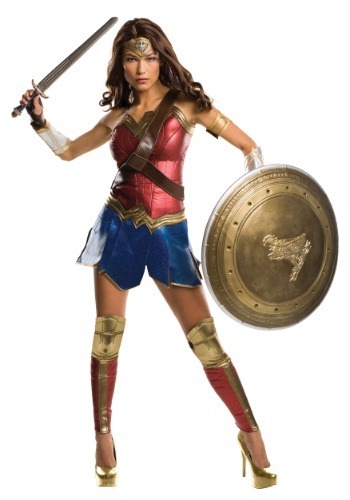 With our costume know-how and your own courage and force of will, you'll be ready to transform into DC comics' greatest super-heroine of all time! This Woman's Grand Heritage Wonder Woman Costume is a high quality outfit that recreates Gal Gadot's look from Batman v Superman: Dawn of Justice. With shiny metallic reds and shimmering blues each piece of this costume captures the powerful and daring Amazonian warrior-princess style. Small touches, like the attached gold belt around the waist and gold armor detailing on the bust-line that is shaped like a bird, add a fierce, yet regal look to the superhero ensemble. Of course, no Wonder Woman costume is complete without a pair of bracers as protection from projectile attacks, so don't forget to strap them on before a big battle against deadly villains. Of course, the one included with this costume may not hold up to a laser beam attack from Doomsday, so use caution while wearing them! Once you're all suited up, you'll be ready for a team up with Batman and Superman. Heck you may even be ready to start up a Justice League of your own.